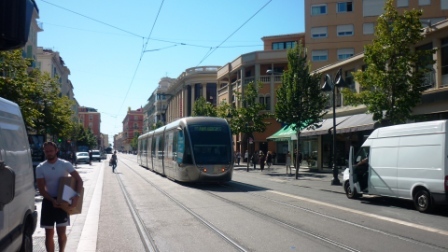 – From the train station, just turn left to quickly avoid the seedy surroundings that are typical of train stations all over the world and you will soon get to Avenue Jean Medecin, which is the main shopping street of Nice and which, since 2008 and the launch of the Nice tram, has become a pedestrian area. On the avenue, heading down on your right, you will notice the immaculately white (and formerly dark grey) Notre Dame Basilica, which is the largest religious edifice in the city and just got a long overdue spring cleaning of its facade. As you head south, the shops and the avenue in general will get progressively more upmarket and about 1 km from the train station, you will get to Place Massena, a beautiful square surrounded by red Italianate facades and some bizarre post-modern sculptures. This square, which is criss-crossed by trams, is really the nerve centre of the city and from here you have various options about what to see next. Plac Massena, also recently renovated with a new tram line, snazzy paving and bizarre humanoid sculptures sitting on poles. 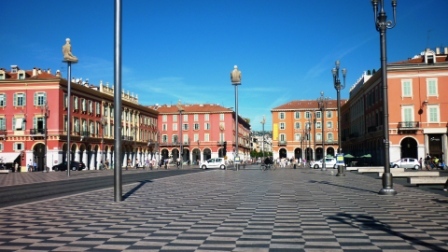 – If you head straight across Place Massena, you will quickly get to the waterfront, with the Promenade des Anglais, the world-famous boulevard that stretches for 7 kilometres along the Baie des Anges between the port of Nice on the eastern side and Nice airport at its western tip. It’s a great place to wander along, cycle or roller-blade with the most interesting section being between the eastern tip (near the port, although strictly-speaking, this stretch is called the Quai des Etats Unis) and the Negresco hotel. Here is a link to one of the more conveniently located stores where you can rent some outdoor equipment (unfortunately only in French). You will be able to admire some of the beautiful Belle Epoque architecture of the top-end hotels (and also some of the inevitable 1960s eyesores, if you happen to be into that sort of thing) and also have a small walk through the charming Jardin Albert 1er. Alternatively, you can just sit on one of the blue chairs which are made available and enjoy the view of the Mediterranean sea. 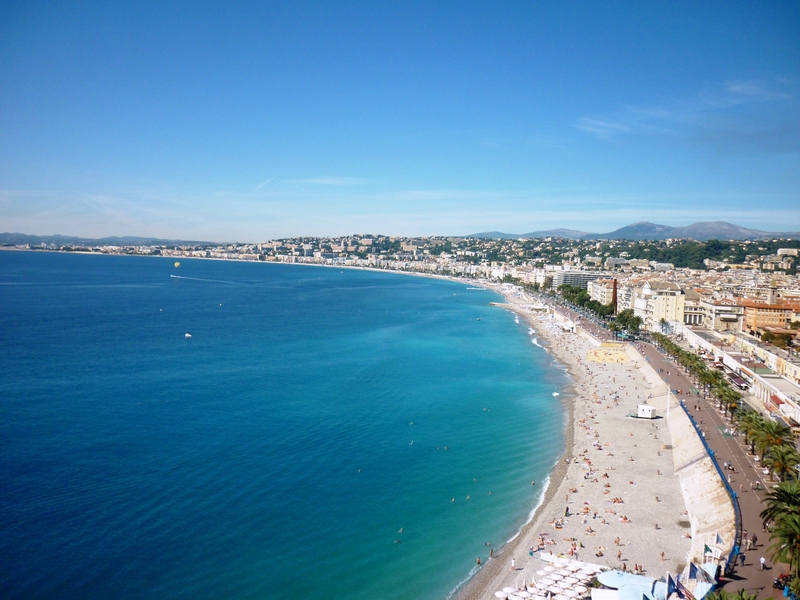 The beach is also an option as the blue water is very appealing in the summer and generally pretty clean; just don’t expect any tropical white sand – the beach in Nice is full of large pebbles! Also, given that most of the beach is public, watch your belongings carefully and don’t bring anything precious along. 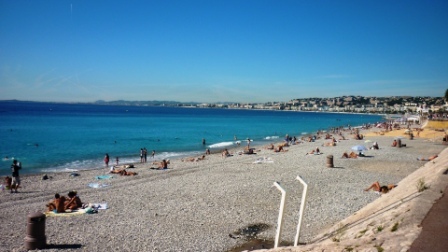 The public beach in Nice – not exactly the fine white sand of the Maldives but the water is nice, warm in the summer and relatively clean! – Turning right from Place Massena, there is a rather busy pedestrian district with souvenir shops, snack bars, coffee shops (not of the Dutch variety) and some rather touristy restaurants which is pleasant to walk around but nothing too much to write home about – mainly a good place to buy your French Riviera mug, t-shirt or fridge magnet on a Sunday if everywhere else is shut. 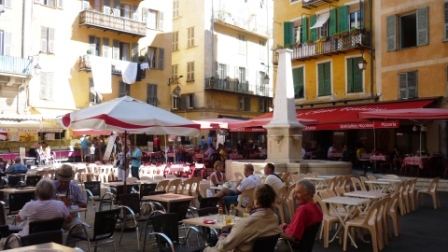 – Turning left from Place Massena, you will head into the medieval old town, Vieux Nice, where the city started off. This is a rather large triangle separated by the Paillon river (buried underground) to the north, the Baie des Anges to the south and the Castle hill to the east. The best thing to do there is to wander around the narrow alleyways and soak in the traditional baroque atmosphere, best done in the early morning before the hordes of tourists have arrived. Main spots to visit are the Cours Saleya (a wide street parallel to the waterfront with plenty of restaurants and where there is a market every morning), Place Rossetti, which is the main square and the various Baroque churches hidden in the streets. A glimpse of Old Nice, Place Rossetti. Old Nice also a decent place to have lunch or dinner, with some wonderful gems where you can sample some of the traditional Niçois cuisine, as long as you know where to go and where to avoid – as always there are tourist traps… Can’t really say which, but generally places with a large laminated menu in 4 or 5 different languages are to be avoided, it’s just a question of common sense. 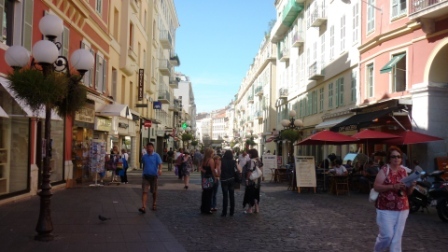 For more information, please check out my walking tour of Old Nice with a lot more details on this beautiful part of town and some recommended addresses. 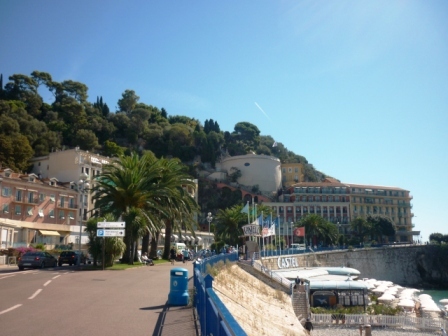 – Afterwards, you can just head north and enjoy the view from the top of the Castle Hill that dominates most of the Nice waterfront. Despite its name, you won’t find a castle on top, as it was flattened by the French during a siege early in the 18th century. However, there’s a very pleasant park on top and some wonderful views over the whole city, especially from the waterfall that is visible from the waterfront. If you want to do some exercise, you can always walk to the top (it’s not that difficult as long as you’re reasonably mobile) but there is also a free air-conditioned lift that takes you up from the bottom of the hill near the waterfront, always useful in the summer. Once you get to the top, you’ll enjoy a splendid view towards the west along the whole Baie des Anges towards the airport, the Cape of Antibes and the Southern Alps behind (see the photo at the top of this article to get an idea) – on a clear day, you’ll be able to see the Esterel mountain range and the Gulf of Saint Tropez. The view eastwards isn’t bad either, over the port of Nice, which was at the heart of the ancient Greek settlement (which was known at the time as “Nikaia”). Another view of Castle Hill, taken from the hills north of Nice. From this angle, it looks a bit like the Acropolis in Athens – the old town is to the right and Port Lympia is to the left. – You can walk down the opposite side of Castle Hill and have a drink on the port (also known as Port Lympia), which has just been completely redesigned and become much more pedestrian-friendly. From there, just hop on a tram from the nearby Place Garibaldi which will take you back past the old town, through Place Massena and up avenue Jean Medecin towards the train station. – If you still have energy, you can take a bus to the peaceful and beautiful neighbourhood of Cimiez to visit the monastery, the Roman arenas, the olive grove and the Matisse museum, whilst enjoying the opulent Belle Epoque architecture. For more information, please see the article dedicated to this part of town. – Finally, for museum and culture buffs, there is a huge choice in addition to the Matisse museum in Cimiez that I just mentioned: also note that access to all public museums in Nice is now free. The main ones are the Musée Massena (with an art collection set in a beautiful Belle Epoque villa by the waterfront), the MAMAC (a very modern and very large contemporary art museum with stunning views from the roof garden over Old Nice) and the Beaux Arts museum (another art collection), a bit further away. Amongst the main private museums (therefore with an entrance fee) is the Marc Chagall museum on the way up to Cimiez, which is probably only worth it if you’re a fan of his. I hope that all this will have convinced that Nice is well worth a visit and is a beautiful and vibrant city in its own right. As always, if you find out any other tips or find any inaccurate information, please feel free to let me know. – By train: Nice is at the centre of the main railway line between Cannes and Ventimiglia, so is easily accessible from both directions. It takes about 40 minutes to get there from Cannes and 25 minutes from Monaco. 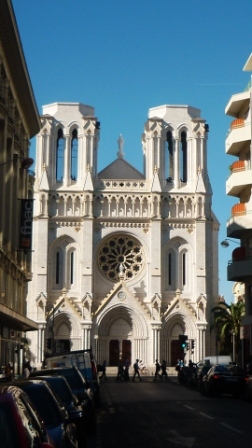 Nice has three railway stations: St Augustin, Nice Ville and Nice Riquier. 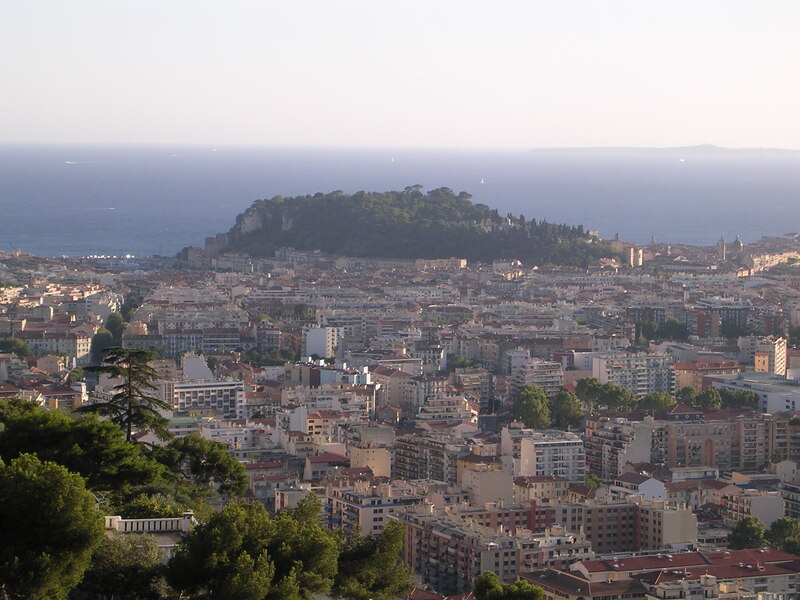 Nice Ville is the most central and the one I refer to in this article. – By bus: all inter-urban bus lines on the French Riviera only cost 1€ regardless of the distance covered. Line 100 follows the coastline east towards Monaco and Menton, whilst line 200 heads west towards Antibes and Cannes. Bear in mind that buses tend to be packed because they are so cheap and that there is plenty of traffic during rush hour so this option is less convenient than it appears on paper. The central bus station in Nice (close to the old town and the modern art museum) is currently being rebuilt so you’ll need to consult this website to see on which street exactly to take the bus (it depends on the line you’re taking). – By car: Nice is a large city which means that it’s hard to park and that underground parking is extortionate, especially during the day. I’d therefore advise you to take the train if possible. If you really need to take your car in the evenings, bear in mind that the public car park underneath Place Massena has a reduced rate from 8pm onwards, but the car parks inside the old town (especially the Cours Saleya parking lot underneath the flower market) do not. There is an extensive and very reasonably priced bus network, which has recently been complemented by a tram line, all at 1€ for a single journey. For the trams, you need to buy your ticket at the bus stop before boarding and then validate your ticket as soon as you get on. As with everywhere, watch your pockets carefully in crowded spaces. For more information on bus and tram routes, consult the urban transport website. This entry was posted in Nice and tagged Azur, basilique notre dame, cars, Côte d'Azur, Cote, french, french riviera, french riviera blog, frenchriviera, frenchrivierablog, holiday, kevin hin, leisure, mountains, riviera, seaside, transportation, travel, vacation. Bookmark the permalink. Hi, thanks for your positive feedback, I’m delighted that you have enjoyed my articles and especially that they are helpful in preparing your stay on the Riviera! I reckon that a day is ok to get the pulse of the areas that you listed above, but you need to be ready to walk a bit and be organised. If you prefer to do it at a leisurely pace, with longer meal breaks and museum visits, allow 1,5 days. If you have time, don’t forget to check out Cimiez and the Matisse Museum, which can be done in about half a day as well. It all depends on your time constraints, the weather forecast and especially the heat: if you are planning to visit in summer, definitely set aside 1,5 days as it can be tough to get around in the heat (even though the temperatures are never extreme, there is quite a bit of climbing to get to the castle and the crowds can also be a factor). I am really amazed with this article ! I woud only add this place http://www.nicetourisme.com/a-faire/108-CASCADE%20DE%20GAIRAUT that is not so well known by tourists coming to the French Riviera. Great Blog Post on Nice!